Sam Kirkland of Epicor Software, left, and Ian Baldwin, business adviser for garden and hardware retailers. The free webinar will feature Sam Kirkland of Epicor Software and Ian Baldwin, business adviser for garden and hardware retailers. Are you ready for a successful season? Join industry thought leaders Sam Kirkland of Epicor Software and Ian Baldwin, business adviser for garden and hardware retailers, on Thursday, April 11 from 12:30 p.m. to 1:30 p.m. EDT as they share the key areas to evaluate, identify and prevent potential problems during your busiest season. Ian Baldwin will also share his “The 5 Numbers Project,” which highlights the five most important numbers leading garden centers regularly track. He’ll also highlight the factors that lead to a successful, healthy organization and ways to measure how your company compares with a similar garden center. To register, click here. Dr. Sonali Padhye, technical services manager at PanAmerican Seed, shows how Kabloom Calibrachoas are offered in multi-pellet format, with four seeds, either in monochrome or multi-color. The technology, deemed Precision Multi-Pellets (PMPLs), is on display at the Ball Horticultural stop. Kabloom is the only calibrachoa on the market available to growers from seed, and PanAmerican introduced six new colors this year. Leucanthemum x superbum Madonna is a seed variety that doesn’t require vernalization. This first-year-flowering Shasta daisy from Kieft Perennials is hardy in Zones 5a-9a and grow up to 10 inches tall. Green Fuse Botanicals introduced a new Begonia Rex series for 2020 called Bewitched in three colors, White, Wintergreen and Red Black. Steve Jones, president, emphasized the fact that the plants can be used indoors or out, noting the robust popularity of houseplants. As part of its First Look pre-introduction program, the company also provided a sneak peek for what 2021 will have in store – three more colors in the Bewitched series – Cherry, Pink and Rose. Evanthia Seeds & Plants showcased its Sunsation series once again, which features four varieties – Yellow, Flame, Lemon and Yellow Spirit. The sterile, pollenless sunflower features a compact habit, large flowers and is available to growers from seed. Dora in the Heartbreakers series of heart-shaped tomatoes from Prudac doesn’t require PGRs or pruning. Prudac, a breeder displaying at the GroLink stop, stands for Production & Research for Urban Decoration and Consumption. Crown Jewel begonias from J. Berry Nursery were bred for their colorful foliage, as well as heat and drought tolerance. This versatile collection is suitable for landscapes, containers, hanging baskets and as a houseplant. Pictured: Positively Peridot. Dümmen Orange is introducing a new collection of Alpine plants called Fleur de Rock that includes delosperma Rock Crystal, available in multiple colors with a compact, low growing habit. 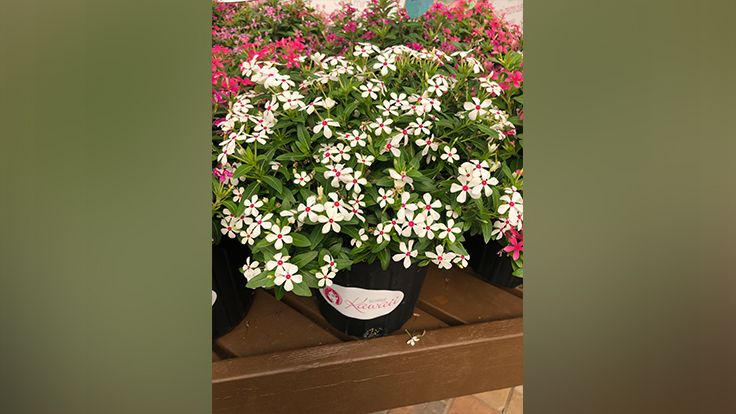 Other varieties include delosperma Solstice, which has larger blooms than Rock Crystal, Iberis Spruzzo and Tuff Candy, Saxifraga Scenic Red and Scenic White, and Aubretia Rock On Pink.